September 10, 2017. Kerrytown Bookfest. It's the 15th annual KTBF, and it's on a Sunday! I'll have a double size booth spot near the entrance to Sweetwaters, and I'm doing a demo. It's the 15th annual Kerrytown Bookfest. And as every year, it's on a Sunday! I'll have a double size booth spot near the entrance to Sweetwaters, and I'm doing a demo again where I'll be showing how I make authentic medieval books by hand from scratch, using all of the right tools and materials. This year I hope to have a screen running a video! 2016 Kerrytown Bookfest! September 11, 2016. The big news is that this year I am in a new booth space, double wide near Sweetwaters cafe, and I will be doing a demo of how I make my medieval books! So come see me working with the tools and materials of the ancients. I'll also have books and art to sell. I'll have copies of our Magic: The Gathering Artists' book "The Gathering" and I hope to have a couple of copies with new hand-made art in them! I'm also working on getting a special cut-away model book based on my 15th c. Psalter which will show the structure of how my medieval books are made. So it will be an awesome display! Its been a good while since I updated “Facebook: Randy Asplund, Artist” or my News page on “www.RandyAsplund.com” and I know a lot of people are wondering what's up. I haven't been offering originals, I haven't been taking personal commissions, and I haven't been getting back with the people who have been very patiently awaiting when I would start taking commissions again. So what's up? First, as many of you know, I had to stop booking private commissions a couple of years ago because I got my schedule filled by some very large jobs. During that time circumstances beyond my control created delays in the completion of the 14th c. style Psalter last summer, which therefore delayed the completion of the Prufrock book. The same circumstances continued to contribute to the delayed completion of Prufrock. While that was bad enough, it meant that a lot of work I intended to get done on writing my book “Secrets of Forgotten Masters” just didn't get to happen. Prufrock was finished in February, but by then I was so far behind on the SoFM book that I had to make a tough choice. I couldn't just keep picking away at SoFM, or I'd never finish, so I decided to just take some more time away from doing private commissions in order to get that done. It would mean almost no income this year, but I can absorb that. And then my 90 year old father's health took a serious turn for the worse. My mom, brother and I have all been incredibly busy dealing with his needs. I have been able to get some work done on SoFM, but not nearly what I need. It's been really tough on my family, and far more important than the book or taking commissions. The upshot is that the rest of 2016 is going to pretty much be a wash for engaging me to do private commission work. If you have been one of the many people I've been holding off taking commissions from, I am really sorry the delay has gone so far. But that's why I wouldn't take the commissions, and I just won't take a commission without having a realistic schedule of completion to follow. If you have already found another artist, or feel you cannot wait for me to get past this difficult hump, please know that I understand completely. It's fine, really. I'm sad that I won't be able to help you out for a while yet, but I hope you will understand. These things really do need to take precedence. My AUCTION of early Magic: The Gathering Art has started! See my Auctions page for info. Currently up for auction is Sea King's Blessing from the Legends set! The Sea King's Blessing auction starts this coming Sunday! For details on rules and how to register click here! I am happy to sign cards sent in the mail, but there is a new movement with the artists to be charging for the signatures. It makes a lot more sense than limiting the number I will sign for people who are just selling them. The price is $2 USD for EACH signature on a card or other object. The first one will be free. (Note: There is no extra signing fee for prints or Artist Proof cards).So if you want cards to be signed, you can send as many as you like -with return mailing. Yes, I will do Original Art Sketches involving my original Magic card themes, either on A.P cards or on other paper, play mats, etc. Just contact me before sending it so we can work out what you want and the price. I also do Full Scale Paintings based on the original card art themes, but they are bigger and WAY better!. Please write to me and inquire about pricing. See my commissioning art page for details. August 3, 2015 AUCTION!!!!!!! Announcing the upcoming auctions of selected early period Magic the Gathering original artworks and Magic: The Gathering related artworks created by Randy Asplund for Wizards of the Coast and Inquest Magazine. Beginning one week after the Detroit GP event, I will start offering original M:TG card artworks for sale, one at a time. I don't have many of my originals from Magic left, and my career is going well enough that I don't actually need to sell these, but I'd like to see them go into the hands of someone who will really appreciate them. I am not posting the schedule of which will be auctioned at what date, because I want to keep that flexible. However, I do plan to start by making the first auction be for "Sea King's Blessing" from the Legends expansion. See below for the list of works I intend to offer. The first auction will be run from sometime in the evening of Sunday, August 23 and will conclude at Midnight EST on Sunday NIGHT (Monday 12am) August 30. There will be an unpublished reserve price on this piece, so the auction must exceed that reserve or the sale is void. June 15, 2015 ATTENTION: Magic The Gathering Art Collectors! I have finally had a chance to look through my remaining unsold artworks from my work in the collectible card game Magic: The Gathering in order to decide which ones I will sell and which I plan to hold onto. Now that I have better scanning and color correction equipment, I am ready to offer them for sale. Here's how it will work: I am holding onto them until after my guest appearance at the Detroit Grand Prix M:TG Tournament (Aug. 14-16, 2015). After displaying them there, I will offer them, probably one at a time, at auction with a reserve price. I have not yet decided if I will run the auctions myself or have someone else run them. Legends: Sea King's Blessing, Raging Bull, Sentinel. Alliances: Both of Reprisal (The Hammerhead and The Leonopteris), Both of Guerrilla Warfare (Dirty Trick and Every Dirty Trick). From Magic Related (Inquest Magazine): Power Atog, Shelkin Brown Out, Serra Warrior Princess, and Juzam Djinn. If you wish to commission work from me I DO want to hear from you! However, I am really booked up with comissions right now. My estimated completion of currently scheduled work is mid-late summer, 2015. I don't feel it is right to add more jobs to the schedule until I have the current long-term jobs far enough along that I can give you a more accurate date for when new commissions would be worked on. I anticipate that sometime between late January to mid-February I will probably start considering new commissions to be worked on during the later half of 2015. At that time I will post an advanced notice here, and on my NEWS page, and on Facebook at "Randy Asplund, Artist." The notice will reveal the date that I will start considering new commissions and working up quotes. This will give the many people who have inquired about commissions a chance to consider.whether they still wish to engage me. Then on that date I will start considering commissions on a first come-first served basis. I apologize for any inconvenience, but that's the way it goes when long term commissions are being worked on. November 29, 2014. It has been a busy year! In addition to other news, I have news for Magic art collectors as well as people interested in commissioning art from me. First, the really big news is that Baen Books has bought an autobiographical story about me as a medieval book artist working in the 21st century. It's actually a good sized piece, and I am very excited about it. The story is for online publication, and you can find it on December 15. I'll post an announcement with the URL at that time. Second, what has been going on here: I have a couple of book commissions going on right now. The first is an abbreviated psalter, done as if it were made in 14th century England. You can see some advance images of the completed calendar pages if you go to the picture albums section of my FB page: "Randy Asplund, Artist" and I will eventually be showing some images of later portions here on my web site. But right now I'm deep into a LOT of calligraphy, and we ended up having to add a bunch of psalms in order to make the page count come out right, so it will be a while. Progress has been slower than anticipated.You haven't heard much from me lately because I have been focused on trying to get this work done. Then I have another book scheduled to be made after that, and it is likely to take me until at least mid-late summer to complete it. It's a really exciting job, but I don't want to go into details at this time. So, what does this mean for commissions? I've been turning down jobs for over a year because I'm so booked. Nevertheless quite a few people have been asking me if they could be on a wait list or put down deposits to get onto my schedule. As much as I'd like to do that, I do not feel it is a good idea to book work again until I have a better idea of when these current jobs will be completed. It isn't fair to the clients, and it puts extra pressure on me. I hope to be able to start considering commissions again by maybe the end of January or early February. Until then, please bear with me. And then there is the matter of buying original art. Again, please bear with me. I have to focus on getting this work done. I've had a lot of you asking about buying original paintings from my publishing career, and I want to help you with that, but each time I sell a painting I have to go through rescanning at higher resolution and color correcting the file to the art before I send it off, plus packaging and mailing. It has gotten to be a distraction, so I need to just not do that until January. I apologize if you were hoping to pick up some art for the holidays, but that's the best I can do right now. Some of you wanted some early Magic art. I have been holding on that as well because I wanted to decide which I want to keep for myself. The value has changed, and I've learned a lot about where to sell them, but I am just not ready yet. Again, best guess, look for announcements on here and my FB "Randy Asplund, Artist" page sometime in mid-late January for an announced selling date. April 15.2014. I regret that I was compelled by my ethics to withdraw from the Guild Of Bookworkers' Seminars of Excellence in Las Vegas in October. I am very disappointed. They really wanted me, and I really wanted to do it. The show would have been my best, a powerpoint showing how medieval books were made, and very rich in photos of the process. I was going to drive out to Vegas with all of my best medieval tools, color materials, artwork, and my latest book. So why did I cancel? Because they told me (not asked me) that they intended to make a DVD of my show, publish it despite my asking them not to do so, and that they were not even offering any monetary compensation for the rights to my material. I told them that many of the images in my powerpoint are from my upcoming book "Secrets of Forgotten Masters," and that I also plan to release a version of my lecture on DVD following the book. They were unwilling to let the DVD idea go or even to compromise at all. It is a dealbreaker to have someone else expect to pre-publish my copyrighted material before I have it published in my own book, so the decision was unavoidable. And there was another reason. I offered a lot of compomise, including making up a special show that is NOT my presentation that I give at schools, libraries and organizations, but they wouldn't budge on paying for the right to sell my creation. I felt it would be hypocritical for me to accept a deal where they refused to offer monetary compensation for publishing my copyrighted material. I have been an arts advocate for these many years, telling people NOT to accept such deals because it undermines the profession. I wish the GBW well, and I hope they figure out that this policy which exploits the presenters uneccesarily lost them a great show in exchange for relatively little income from the right they wanted, but that's life. Sometimes it is hard to walk away from an otherwise good thing, but if we stick to our principals life is better in the end for all of us. I can find other ways to promote my work, and with you out there helping to spread the word, my book will be a great success. The big news today is that I have accepted an invitation to be a presenter at the Guild of Book Workers annual Standards of Excellence seminars. This will be held in early October 2014 in Las Vegas. I'll be one of four primary speakers, giving a PPT on making medieval books. I don't know yet if I will be doing some kind of demo or not. This may impact my plans to enter the Grand Rapids ArtPrize competition this year. We'll see. Between that and the NASFic convention this summer and the very large commission I am working on, something might have to get cut, and that would be ArtPrize. The Big News! At last, our artbook The Gathering has arrived! And I am selling autographed copies of it. This is the special book that I and the other early Magic: The Gathering artists made as a 20th Anniversary Reunion project. The Gathering is a beautiful book, with each artist writing their own portion, creating a whole new painting special for the book, and a look at one of their early M:TG card paintings.There is even a section showing preliminary sketches for some of the new art. The forward is by Richard Garfield, the creator of the game, and the Afterward was written by Jesper Myfors, our first art director. To see a video page-through of this gorgeous collection please visit the Kickstarter update 35 page. To Order: Please email me first and tell me how many copies of soft or hard cover you want. I have a limited number, so wait until you hear back from me before sending money. You may send a check or use PayPal. If you use PayPal, please use the "Send Money" rather than "Make Payment" so I don't get charged fees. My contact info is in the menu to the left. If you order a copy from me I will autograph it and personalize it. I currently have Soft Cover copies available for $24.95 each, plus $5.60 for USPS Priority mailing. If you live in Michigan you must add $1.50 sales tax. Please email me FIRST before sending money, just to make sure I still have a copy for you. I only have a limited number. The Hard Cover version is coming very soon, but hasn't arrived yet. That one is $42.50 and MI tax is thus $45.05. I expect it should fit in the same Priority envelope for $5.60, but I won't know for sure until I have copies on hand. Please contact me to be put on the list to get one. First come, first served. Lots of news today. Our art book: The Gathering is just about to be mailed from the printer! Its a wee bit later than we hoped, but the quality and added features were well worth it..
Also- My artist friend Tom Baxa has just released his new book “Get Work as a Fantasy Artist” and I have written a contribution to it. Here is a link to a page on my web site about it. In addition, I have finished my Little Mermaid by Hans Christian Andersen artist book and before I had much of a chance to show it around it was purchased by the Rare Books department of the State of Michigan's Library, The Library of Michigan. I'll build a web page for it eventiually, but for now you can see it on my "Randy Asplund, Artist" page on Facebook. I am swamped with work right now, having been engaged to create a faithfully accurate English mid-14th c. style Abbreviated Psalter, in the modern English languace for the use of the client. It will take much of the year because I will simultaneously also be working on my 2014 entry for the Grand Rapids ArtPrize. All in all, the new year of 2014 is looking to shape up really great! I can't believe I haven't updated in so long. The big news is that I just added three events to my schedule of appearances. I'll be heading up to near Ottawa, Ontario to teach all day at an SCA event dedicated to medieval scribal/book arts. 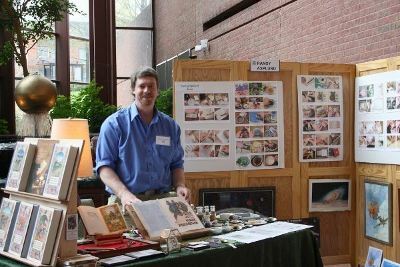 I will be showing several PPT shows, brewing colors from raw materials, and showing a lot of raw materials and tools. The Kerrytown Bookfest is fast approaching. I hope to have a couple of copies of my new version of Hans Christian Andersen's The Little Mermaid for sale. I'll make a web page for it when the first copy is finished. They will be bound as medievally inspired art bindings. One of the illustrations inside was made as a stretch goal reward in the Kickstarter campaign to fund our very successful Magic Artists' book The Gathering. Then on September 14, I will be at the Magic: The Gathering Grand Prix event as a co-artist guest with the amazing fellow MAGIC artists Mark Tedin and R.K. Post!. This goes great with our new artbook coming out! ORIGINAL MAGIC ART: I still have not decided yet when I will offer them for sale again, but I plan to bring every Magic card art original that I still have with me to the show at Cobo on September 14. This might be your last chance to see them in public.I also plan to bring a big bunch of other CCG original art. I have also accepted an offer to travel down to Florida this coming winter to teach at another SCA Scribal/Book Arts event. Details will come after we work them out further. The combination of our book The Gathering, the 20th Anniversary, and the fact that the art I did in Magic is all early stuff has changed the market significantly. I have decided to TEMPORARILY withdraw the offer of sale for my remaining pieces while I re-assess the changing market. Original artworks affected include: Sea King's Blessing, Raging Bull, Sentinel, Reprisal-The Leonopteris, Reprisal The Hammerhead, Guerrilla Tactics-Dirty Trick, Guerrilla Tactics-Every Dirty Trick, Rogue Skycaptain, and the Magic Spoof pieces from Inquest Magazine: Power Atog, Serra Warrior Princess, Shelkin Brown-Out, and Juzam Djinn. I will redesign the Magic web page here and post new prices and availability when I feel more comfortable with the fair value of the art. I will offer preliminary sketches of my new painting "The White Tree" made for our new book The Gathering. There will also be pictures of the original sketch art I made for Magic, and it may be offered for sale. The workshop went amazingly well at Hollander's School of Book Arts this weekend. I am really happy with it, but I'm even more happy to make the big announcement that our book "The Gathering" has just gone live as a kickstarter project! It looks like 2 hours after the site was announced we seem to have almost half of what it will take to have it made! Incredible! I am a collaborator on a fabulous Art Book! We call it "The Gathering," and it is a reunion project of most of the early artists who worked on the Wizards Of The Coast collectible card game Magic: The Gathering. We are in the midst of a very successful Kickstarter campaign to fund the book, which will be out this summer for the 20th anniversary of the premier of the game. Please take a look at the kickstarter page and see the wonderful video made by M:TG artist Mike Kimble. Rediscover over 30 of the original artists of Magic: The Gathering® reunited to create new paintings for this limited release art book. On Kickstarter, February 26th - March 28th. Zinga-Pow!!! Have I ever been through the grist-mill! I'd been feeling run down for a while, and we've been trying to figure out my acid reflux problem. My doctor prescribed an ultrasound and when I called to learn the results she said "Get over to the Emergency Room! You have a very angry gall bladder." Well, I was in the midst of two commissions, and thank god my clients have been very understanding, because my gall bladder wasn't just angry, it was steamin' mad beyond words. The doctors at the ER said "Your gall bladder is chock full of stones!" They gave me morphine. They gave me more morphine. Then they gave me something 7x stronger than morphine, but derived from it. They discovered that I am immune to morphine and its related drugs. My surgery was scheduled for last Thursday, the 31st. It was supposed to be a quick in & out laproscopy. They cut me for that and then discovered the true vehemence of my gall bladder. Angry? Nahhhh. It WAS livid! that's when they cut the six inch gash and really went to work. My surgeon later described a normal gall bladder as being thin like a plastic bag and about as big around as a golf ball or less. Mine was more like an orange in diameter and from how wide apart he held his fingers, about 3/8" thick! He said it needed a lot of "dissecting" to get at it, and then they couldn't just tie it off a usual. The word “dissecting” is not one that I ever want to hear from a surgeon again. Going home the same day was not an option. They didn't know how many days I'd be there. They gave me an IV with a pain medication and a trigger I could use every 10 minutes or so. My night was spent hitting that button every 10 minutes or so. The next morning I figured out why it didn't seem to work. They had been giving me morphine! It took 2 hours of telling 43 different nurses, a med student, and my surgical resident who actually discovered my morphine immunity before I finally threatened a lawsuit. That got results in about 2 minutes. I'm home now and recovering slowly. I'm caught up with business communications and back to work on the last job I owe. The going is slow.... but believe it or not, I've had worse! We made new brush trays and globose ink pots. They looked great after the bisque fire, but during the glaze firing we had -issues! Minute crackling in the brush tray glazes and strange blistering on the outsides of the ink pots. After attempts to salvage the brush trays, they work fine if I spray in a clear lacqer and then wipe it out with lacquer thinner, but they also have a slight warp, so I've decided that I'll just use them for classes. The ink pots are fine inside, but I salvaged them bt scraping off the bad glaze, filling the bare areas with epoxy mixed with pigment, sanding flush, and then spraying with gloss lacquer. You have to know what you are looking at to tell it isn't the original glaze. If you are interested in one of these, please write. Otherwise, you have to wait for me to make more of them in 2013. I also plan to make a reproductions of the Byland Inkstand.. It was found in an Abby excavation and has 3 ink wells and is surrounded by several holes for resting quills. I have always signed cards for fans for free because I wanted to do something nice for the many people out there who really do appreciate the art we did for these games. After seeing so many of the cards I have signed for people over the years being flipped on eBay, including in sets of a dozen of the same card, I'm feelin' kinda abused, so I have decided to adopt a new policy. I'm only going to sign one example of each card type for any person from now on. I'm sorry for those of you who have genuinely enjoyed playing with multiples of a signed card. The selfish ones out there have ruined that for you, and that's a shame. I plan to continue to sign cards in the mail when a S.A.S.E. is sent, and I will still do sketch cards for a fair market price for comparable artwork pricing. I have great news! Our collaboration at the University of Michigan was a huge success and we were given a Jury of Your Peers award and cash prize. Wha-hoo! (It was really John Merigian's idea). I'm now gearing-up for the Kerrytown Bookfest and last night I finished binding a miniature book of a 12th c. Bestiary. It was a HUGE job because the digital files needed a lot of work on every one of 206 pages. I'll try to post it later this week after I have taken pictures. I just returned from the Alumni Show Reception at the Slusser Gallery at the UIniversity of Michigan. It was a wonderful event and the collaborative piece that I made the little work on the easel (pictured to the right) won an award and cash prize. Very cool! But it was a wonderful idea that John had, so kudos to him for coming up with it and assembling the various works into one. I am in the midst of the most authentic medieval artwork I have ever made. Even the parchment was made in the 1400's! The ink was made from a hawthorn tree using the Theophilus recipe, the gesso is the exact gesso made from the De Arte Illuminandi Recipe, the drawing was done with a lead-tin stylus and after being inked, it was erased with bread. 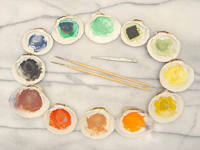 The colors will all be 100% medieval pigments and dyes. The size is 5-1/4 wide by 7" high. Yesterday I stood in the river rinsing goat skin to scrape for parchment.. The skins on the racks will be dyed using ancient dye techniques in a matter of a few days. The Society For Creative Anachronism is the world's largest historical re-enactment organization, but it recently suffered a severe financial blow. The people of the SCA have banded together to try to raise funds to help the organization, and so an auction to benefit the SCA will be held at the Pennsic event thus August. Artists have been asked to make works to donate for the auction and so I have created this small work of medieval Italian manuscript illumination entitled "I AM PROUD TO BE A MEMBER OF THE SOCIETY FOR CREATIVE ANACHRONISM. 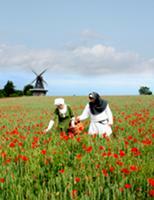 ".Please take a look at the web page I created for it to learn more about this very authentic work. Back from the Virginia Festival of the Book! I finally have a chance to report on the VA Festival of the Book in Charlottesville, Virginia. We had a marvelous time. The festival organizers were really good to us and the site for the main functions was a very nice hotel Ann and I set up the booth in the atrium of the Omni Hotel's lobby, and we were busy all day. She sold prints while I talked about medieval manuscript illumination and bookbinding. In this picture you see my display walls on the right, my colors and tools in the middle, a few of the books I've made, and at left the brand new book display holding all five of my latest book covers for Pliny's Historia Naturalis. We were pretty swamped all day. 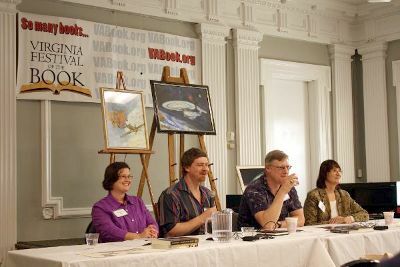 On Friday evening I was on a Science Fiction panel with authors Leona Wisoker and Jack Campbell (whose real name is John Henry), and moderator Chris Oakley. Although the talk was all about science fiction and fantasy, I was very happy to tell people exactly how medieval books were actually the ancestor of fantasy illustration. I brought along my latest little book, a 5x7 gothic binding filled with religious fantasy art. In the image to the left I am showing off the book to one of the audience following the program. On Sunday I had a gallery show and Artist Talk with a really good ink drawing artist named Greg Kelly. He also does many other media, but was showing just that. I had many of my manuscript illuminations on display. The event was packed, with many people having to stand and spilling through the doorway. It was GREAT! After the festival we headed home, but we took a nice short detour to see the Natural Bridge. Its quite a feature. We also went into the nearby cavern for that tour. Thomas Jefferson once owned the Natural Bridge. He also once owned the taller mountain next to the mountain where he built his home Monticello. It appears that the private owners of Monticello found out that a private investor wished to develop on top of the taller mountain so the Monticello owners bought it back for $15 million. In a twist of Irony, the inheritors of Jefferson paid the same amount to buy back a mountain Jefferson once owned for the same dollar figure that Jefferson paid for the entire Louisana Purchase, $15 million. Dang! Talk about inflation! And of course to pay for that, Monticello now costs $24 to visit. An expensive walk around a mansion, to be sure. But isn't it nice to know that it won't be soiled by poor people? Sheesh! I just received my artist copies of Pliny's Historia Naturalis from the Folio Society publisher. OMG! They are just stunning! The colors came out incredibly well and they have gilded every place that my original cover paintings where had put gold. I'm ecstatic. I will have them with me at the Virginia Festival of the Book this coming weekend. You can see the covers (albeit at an oblique view) on the Folio Society's web page. There is a link to expand the images list and it will show you the covers. The new www.Randy Asplund.com is now online! What a lot of work! But I think you will find a much better organization and ease of navigation. Whether you love space, the middle ages, vintage aircraft, or modern art, you will find something of interest here. I have quite a few pages showing how I make my art, and I have some research photos from interesting museum sites in Europe and other places. There is a lot to see, and a lot to share. Tell your friends, and have a great time exploring! It has been too long since I have made updates on this site and a lot of art has been made. I spent several months making a whole 15th c. style book for one client, then in September I had the Kerrytown Bookfest, three weekends of a parchment making workshop I taught here at the house, and 5 book covers to get done! It was crazy! But I won an exhibitor award at the Kerrytown Bookfest, and that was really nice. Later, I made another MAGIC card painting into a bigger and better version, so you'll see the new Dark Judge (based on Ebon Praetor) when the web site relaunches. 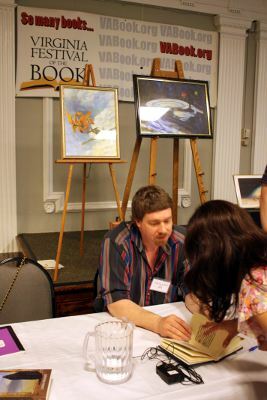 In February 2011, I was Artist Guest of Honor at Mysticon's relaunch, and this March I will be back in VA as a special guest of the Virginia Festival Of The Book. My wife Ann Asplund has finally launched her web site AnnOtherDay.com It is dedicated to fiber arts, especially making specialty clothing. She knits, needlebinds, embroiders, weaves, and creates designer clothing for contemporary with a flare, for medieval, viking, fantasy, and steampunk interests. She is also making things in wood and ceramic. Please visit her web site soon! Especially if you want something unique and really cool for a gift or for yourself. The following is for SCA members: After thinking about it quite a bit, I decided that I wanted more time with my wife at Pennsic, and more time playing at the knight in Pennsic battles while I'm still young enough that it is fun. So I have decided not to exhibit at the Guild Mirandola Booth anymore. I will visit, and if asked I will teach, but to find me at Pennsic might require leaving a message at the Barony of Cynnabar camp or seeking me after I finish with a class. In other news, we now have a lot more wood working tools, and a new drill press. Making books requires wood working, and these things will help a lot. I've also been making cast bronze scribe tools and book hardware thanks to my friend Tomak. The new computer system is working and at long last the new Wacom graphics tablet will talk to the Linux system and programs, which was just in the nick oftime for a big digital job for a couple of Baen Books illustrations. Linux doesn't resolve all issues, so I still have my Mac to fill in the gaps. The Virginia Festival Of The Book: March 21-25, 2012 in Charlottesville, VA. I have been posting things on my Face Book pages. My business name in Face Book is "Randy Asplund, Artist" Please stop by and visit to see what I've been doing. I post pictures of projects and my latest works when I can. I also post things of interest to artists and collectors when they come up. It is an addition to this News Page. Ceramics moving forward with a new potter's wheel! Thanks to Greenhills school, who donated their two old kilns to me when they were upgrading, Ann and I have been branching into the ceramic arts on a larger scale. The garage is now wired for 220 and we just picked up an old Shimpo potter's whhel I had to restore it, but that's fun too. We're already making reproduction medieval pottery for my illumination studio and for props for TV documentaries. I've been working with the turnsole plants, the rue, blue cornflowers galore, and that big batch of black nightshade. The color experiments for most of it are done, and the results are exciting! I'm also doing detailed examinations of what happens to these plant juices over time after they have been added to verdigris, and studying verdigris closely, trying to pin down when it or other colors are incompatible and when they are not. I'm also working on similar issues with Orpiment. I am doing a study of parchments and some papers from the middle ages. I've been through over 40 MSS so far, checking the page thickness and characteristics. On several MSS I also checked opacity and Pantone color. Results will be in my book. Secrets of Forgotten Masters: A 21st c. Arist's exploration of the technological processes used for making illuminated manuscript books from 700-1500 in Western Europe. Well, that ought to do it for now. I hope you enjoy the site!